Claire Tremblay is often cited for legal opinions for other sites and publications. These articles feature her commentary on legal issues. 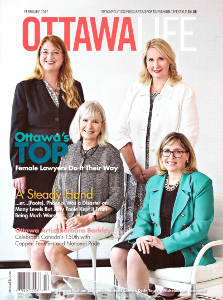 Claire was featured on the cover of Ottawa Life Magazine as one of the top female lawyers in Ottawa. You can read the full article here. Recent Immigrant Women To Canada in Abusive Relationships Must Choose Between Deportation or Abuse by Emma Pauling of Vice.com. June 2, 2014. New Immigration Rules Isolate Victims of Abuse by Emma Pauling at Capital News Online. October 11, 2013. Going Dutch: Should Canada Follow the Netherlands’ Prostitution Model? by Claire Tremblay for The Ottawa Citizen. December 2, 2011. Located in Ottawa, Ontario, we’re a small but dedicated firm that will help you with matters of Family and Immigration Law.